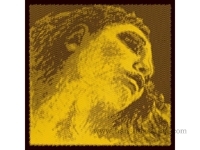 PIRASTRO 에서 2012년 새롭게 출시한 바이올린 Evah Pirazzi GOLD 입니다. 화려하고 특별한 음색을 연주자에게 최대한 누리게 해줍니다. G 현을 제외한 나머지 E , A , D 현들의 구성은 2가지 모델 모두 동일합니다. 우아하고 부드러운 최상의 음역을 가지고 있습니다. This new string set has the potential both to seduce and inspire the violinists. the high standard set by our Evah Pirazzi and Obligato strings. for effortlessly smooth transitions from string to string. which is the secret of its seductive powers. the finest nuances of the quietest passages or to play close to the finger-board with confidence. translating the violinist's energy into powerful sonorities. Such responsiveness means that violinist and instrument connect without the slightest delay. We offer two versions of the G string – one wound with gold and one with silver. her personal preference as well as that of the instrument. neither material detracting from the rich volume which is the hallmark of this product. and a projection of sound that is both far-reaching and focused. and a large, noble, and smooth sound to the very top of the register.